In the heart of the Costa del Sol, Marriott's Playa Andaluza beachfront resort is located near marinas, nightlife, and other fabulous diversions. Beach and water sports, sailing, horseback riding, golf, tennis, fine galleries, and unique shopping are all accessible. 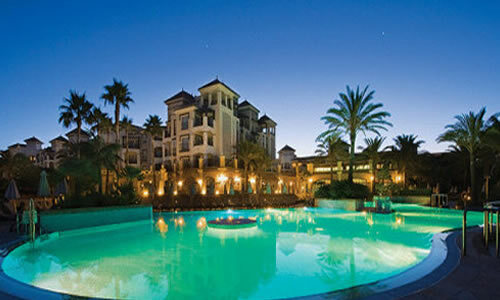 Offering superior two and three bedroom villas as well as deluxe guestrooms, Marriott's Playa Andaluza has been designed to reflect Moorish influence in traditional Andalusian architecture and decor. Large airy rooms with high ceilings and sweeping views from private balconies, the spacious apartments and villas have all of the modern conveniences as well as luxury extras. Each unit has a fully equipped kitchen with all crockery, cutlery and appliances to prepare holiday meals at home. Roomy master bedrooms with king-size beds, bathrooms with extra large whirlpool baths, separate showers and large screen televisions throughout complete the accommodation at the resort. It's worth noting that although internet service is free, the signal may vary due to local conditions.